Last season, I was tired of kale. Tired of sautéing leaves, tired of putting green stalks in soup, tired of the dense chewiness, tired of hearing how good it is for me (high in flavonoids, blah blah). So, come late last October, I choked down the rest of the leaves, relieved to be finished with my duty for the season. A farmer friend of mine told me kale would survive the winter and come back hardy and healthy in the spring if I cut off the dense stalk right at ground level. He was right. We have several thriving kale plants from last year’s stalk. Unfortunately, the passing of months did not diminish my kale fatigue and I have not harvested much of any of this year’s leaves. Yet here we are again, a new October, and I knew I needed something new to try to help me take my kale medicine before the frost. So I tried a variant on a kale chips recipe I found in the world of dehydrators/raw food. I can honestly say that it was the closest I have ever come to eating a plate of food like an 18-year-old-boy eating a pizza (there was no chewing involved). I inhaled these delicate green chips. Kale chips are crunchy, intensely subtle, salty, warm and wonderful. There is not any of the bitter flavor associated with kale when prepared this way. As an even better bonus the chips are super fast and easy. When I did a bit more research I learned that you can bake kale chips in your oven for those who don’t have a dehydrator. Instead of dehydrating for two to three hours at 95 degrees F, you can pop them on a baking sheet for 20 minutes at 300 degrees F (or until crisp). Here is the recipe I used for my chips. • Cut four leaves from plant. • Remove stem and cut into large pieces. • Toss in a bowl with 2 tablespoons apple cider vinegar, 1 tablespoon olive oil and sea salt. • Place in the dehydrator/baking sheet. • When they are crispy and warm, they are finished. • Devour them as fast as you can before your friends learn how good they are. Oh kale, of cruciferous and flavonoid fame, thank you for being such a delicious chip. You pulled me in with your sturdy frame and healthy fronds, and though I strayed from eating your flesh, I am once again pulled back into the fold of loving you — with your sea salt, oil warmth beguiling me in. All hail kale! 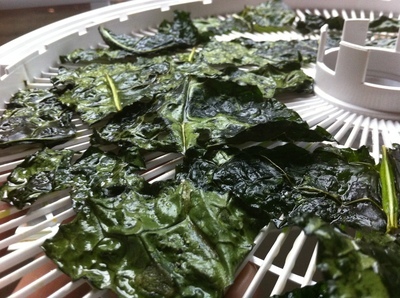 This entry was posted in In the Kitchen (recipes & more) and tagged Corinna Borden, Dehydrating, kale, Kale Chips, Real Time Farms. Bookmark the permalink.